Brooklyn Bridge Park maintains a unique position in the pantheon of city parks. Since the first pier opened in 2010, the 1.3 mile waterfront park has grown steadily, welcoming over 4 million people last year. 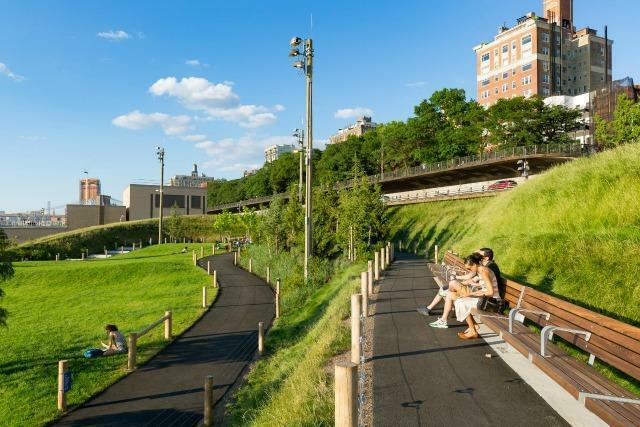 Its current popularity was the result of decades of work from a group known as the Brooklyn Bridge Park Coalition, and their effort is widely seen as a model for city and community cooperation in revitalizing an otherwise decrepit post-industrial space. But the park is also among the most controversial plots of land in New York — a flashpoint for debates on private development and public authority, with a carousel of impassioned opinions from affordable housing advocates, preservationists, and the neighborhood’s NIMBY contingent. Those frustrations have manifested in multiple legal battles, including an ongoing lawsuit brought against the park by the Brooklyn Heights Association, a group that doesn’t want two new towers on Pier 6, which would provide some affordable housing and allegedly block their views of the harbor. Inheriting this situation is Eric Landau, new president of the Brooklyn Bridge Park Corporation, the nonprofit responsible for the park. A former deputy commissioner in the city’s environmental protection agency, Landau was tapped to lead the expansion of the park by Mayor Bill de Blasio, and took over the position this past April. Last week, we met Landau at his offices atop the park to discuss his plans for Brooklyn Bridge Park, and what he learned during his first summer. You’ve been in this position for four months now. Before that you were with the DEP and before that you served as Vice President of the Prospect Park Alliance. Can you talk a bit about your general philosophy to managing the city’s green spaces, and how that might apply to BBP specifically? We’re now at a place where 80 percent of the park is built and open to the public. 10 percent of the park is in construction, namely in Pier 3, which is going to open next summer, and then 10 percent — the Pier 2 Uplands and the Brooklyn Bridge Plaza — are in design now. We’re at the point where the park is pretty much built and open to the public, and so I believe that my time here is really about helping the park figure out its identity in the community. I’m a big believer that parks serve a variety of uses for a variety of audiences, and so I think that parks should be places for relaxation and respite, whether that’s just wanting to get away with a blanket and a book to meeting up with a group of friends to more formal programming. Parks should provide that total respite from the everyday life, and they should be great places for recreation, for amazing programming and hubs of community development. What I think makes Brooklyn Bridge Park so unique is that it has all of those things in a really unbelievably beautiful and well-designed way on what were once working, commercial, waterfront piers. But the challenge is in terms of where, within those various uses, specific user groups feel the priority should be. They all have their own perspective, which may not necessarily mesh with somebody else’s perspective on it, so that’s the challenge. While the specific issues might be slightly different, the larger question about park management and how a community feels about a park is similar to any other park in the city. The other big thing that makes BBP unique is how it’s financed. Unlike other parks, BBP is entirely funded through private real estate development within the project’s footprint. That’s true. Certainly the development projects here in the park are very different than, say, that of Prospect Park. I’m not aware of another city park that has the same model as us. So they have very different challenges than I have. Yes, I’ve got people complaining about the buildings, but at the same time I also have these buildings, which provide financial resource that allows us to be completely self-sustaining. I don’t get any money from the parks department or from the city to operate the park annually, which allows the city and the parks department to put those finite resources that they have into other parks all around the city, in neighborhoods that need it, and allows us to take care of this park and make this an unbelievable resource for the borough and beyond. The past few years have brought a luxury hotel and luxury condominiums to the park, and now there’s this lawsuit from the Brooklyn Heights Association over the two new towers at Pier 6. But beyond the specific BHA complaints, there does seem to be this perception among some park-users that the space is becoming overdeveloped. Do you understand where that complaint comes from? What I would say is that 90 percent of the space is parkland, 10 percent is development, and that 10 percent allows the other 90 percent to be there. That, for me, is the big selling point. The other thing I would say is that if you look at it, we’ve got the John Street property, Empire Stores, the hotel and the PierHouse, One Brooklyn Bridge Park, and the Pier 6 development. And so of those five, four are historic — they predated the park being here. 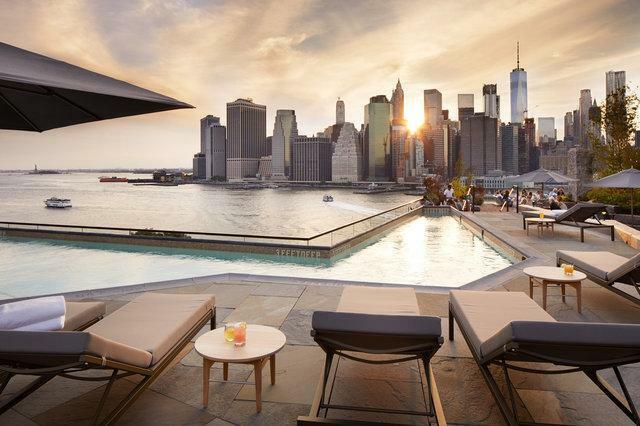 The hotel is a new structure, but that’s where the old cold storage warehouse was, and One Brooklyn Bridge Park used to be the watchtower building. So these buildings predated the park. The only new buildings that are part of what I would call the development projects are John Street and the coming Pier 6, pending victory in the lawsuit. Everything else was here previously, and so again, the 10 percent provides for the 90 percent, but at the same time, so much of that 10 percent is historic. Some people might say that even if the structures are historic, they’re intended to attract a new type of visitor — wealthy New Yorkers or tourists, mostly. I would argue that a huge part of parks, I believe, is to be hubs of community development. Brooklyn Bridge Park is not a one or two neighborhood park, nor should it be. I believe, like Prospect Park, it should be a borough-wide facility. Brooklyn Bridge Park also does serve as a tourist destination, but what’s so important to the vitality of New York City is that we have attractions that people come from all over to see. Any bad feelings, and as you indicated, there are some people that have bad feelings about the park, it’s about figuring out what those are and what, if anything, can be done to turn the corner, or rectify it. It’s about figuring out how the park is being used, should be used, can be used. 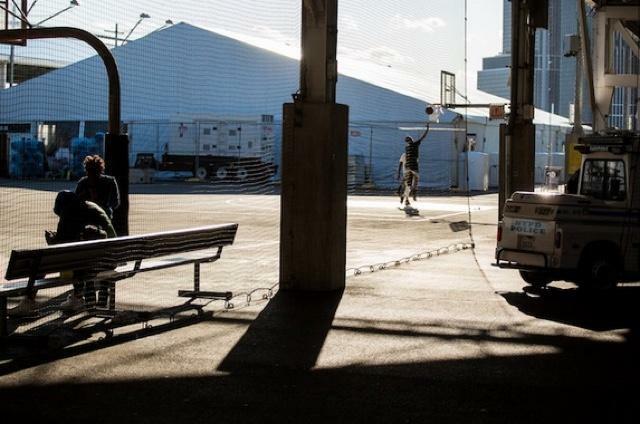 We look at spaces — on Pier 2 we had shuffleboard, but nobody played shuffleboard. I think shuffleboard is a great game, but nobody played it, and so we said look, that’s not working, and let’s put something in that space that people will try. So we’ve removed the shuffleboard and we’ve put in these great ping pong tables, and we’re gonna see how that works. Now that the park has been built, it’s figuring out what the park’s place is in the context of the immediate community and the broader community that uses it, the borough itself, and beyond. That’s probably a good segue into the Pier 2 basketball courts, which are hugely popular, and also reportedly the cause of “trauma” for some park neighbors. In the past, the pier has been shut down, sometimes because of “disorderly” high schoolers, other times for no other reason than a bunch of people are using it. Are you happy with the way these issues have been handled in the past? Certainly there were some moments in time where there were security problems. I don’t think that there were as many as some have implied, but we certainly we had some issues. We had an issue actually the week before I started, during spring break, where there were some fights that broke out on Pier 2. It was during spring break. The reality of that was we had an 80 degree day during spring break, schools are closed, and unlike the summertime, the beaches and the pools aren’t open, and so we become a main focal point for people. The reality of Pier 2 is that, like all of our piers, for that matter, they have a capacity to them. Only so many people can be on them at one time, and I think we had a situation on Pier 2 where, as I understand it, the space reached capacity and the police department, in consultation with the park staff, made a determination to, for lack of a better term, freeze Pier Two. I understand there are people that were not happy about that. Some neighbors have called for the courts to be removed, with language that seems like thinly-veiled racism — block associations calling demanding the courts be replaced with something that doesn’t attract a certain demographic, for example. Can you believe that that’s the conversation? It’s surreal. There are those in the community that have suggested that the basketball courts be removed so that there could be tennis, or I was asked in a meeting for mini golf instead of basketball courts. You know, it is really unfortunate that in today’s day and age there is that type of overt racism. Because I think that that’s what it has been, and I think that’s really unfortunate. That is not to say that tennis in this park couldn’t be a great thing. It could be a great thing, but our basketball courts are hugely popular, hugely successful, and provide a great resource to lots of different people from lots of different neighborhoods, and lots of different ethnic and cultural backgrounds, and that is what parks are there to provide. Will you commit to not closing the basketball courts? I’m not gonna close these basketball courts. I think the basketball courts are an amazing facility in the park, and I’m not gonna make any change. Again, I’ve been here four months. It’s not my style to make any change in such a short tenure. My approach with anything, whether it was the basketball courts or something else, my approach is to see how the specific activity works, how the community uses it, whether or not it provides the resource that we think is needed. In my experience, in parks, and this was true at Prospect as well, is that something like the basketball courts, the fact that they are so popular only highlights the fact that they are so needed. These basketball courts are hugely popular because there is a need to have really well run, well maintained basketball courts. Pier 2 is an unbelievably democratic space, if not the most democratic space in the park, and that’s what parks should provide. I would say that an equally democratic space is the picnic peninsula, where you have people from every neighborhood, every culture, every ethnicity, that are coming here to barbecue, first come, first serve. It’s what parks should be, all across the city, and I’m really, really proud of the fact that we provide that here. It’s unfortunate that not everyone sees it that way. The spate of hurricanes across the country has caused a lot of New Yorkers to think back to Sandy. According to disaster planners, New York is near the top of the list of cities most susceptible to a catastrophic hurricane. How does that impact your job, when trying to think about the long term sustainability of the park? The park was built with an eye toward resiliency and protecting against climate change, and we had a very early test of that with Hurricane Sandy. I mean there are photos where it looks like the carousel is floating away. And so I actually think that such a great story of Brooklyn Bridge Park is that Hurricane Sandy came in, came in hard, did devastation all over the city, and Brooklyn Bridge Park is still here. We survived it. But look, Hurricane Sandy was a massive, massive storm, and hopefully one that New York doesn’t have to deal with for a very long time. But at the same time, the park’s design really took that type of storm in mind, because if you’re building directly on the waterfront you sort of have to. A lot of the plant life, for example, was specifically selected because it was known to withstand salt water in that type of event. What does that look like in terms of planning? How far ahead are you thinking? One of the things that we are hypersensitive to is the integrity of the piles under the piers themselves. The way that we’re doing it now is we sort of go pier by pier. We’re doing a type of maintenance that takes a lot longer and is a lot more expensive. [Now we have] a new approach that we refer to as preventative maintenance, which allows us to sort of do all of it together, and over the next 30 to 50 years, if we do the preventative maintenance, will save us about $85 million in costs. So you’re talking about a real, real expense. Again, it’s a nine figure price tag — it’s over $100 million — but it’s a nine figure price tag that will save us significant resources down the road. And the water in New York City is cleaner than it’s ever been, so it makes it that much easier for marine life to actually get to the wood piles and bore holes in them. So we spend a tremendous amount of resources preserving and protecting those piles. One of the reasons the Pier 6 development is so, so important — the significant revenue that comes directly to the park will allow us to do the needed maintenance on those piles to protect the harbor. These projects pay direct revenue to the park, and that is how we fund, not only the annual park maintenance, but also our building budget that will allows us to protect and preserve the piers, and thus preserve the park for generations and generations to come. And finally, you took this job just in time for the reopening of Squibb Bridge, the most important and controversial pedestrian bridge of our time. How’s things with Squibb? Squibb is great. It’s back, and wildly popular. There are people on it all day long ever since we reopened it in April. We’re really happy that it’s back. It creates another great entry and exit to and from the park. It’s not as bouncy as it previously was, but it’s totally structurally sound. Read this article on Gothamist’s website.